I scrubbed my floor on my hands and knees. What you must know is this never happens, like ever. But after contemplating some words of wisdom from my beloved great-aunt, that a floor isn’t clean until you get on your hands and knees to do it, I decided to take a whirl at it. I must admit, there was something so gratifying about seeing the progress being made, scraping every last food scrap off the floor. That is once I got beyond the horror of actually analyzing it that close. There are no other words than disgusting and thank Heavens for the development of flooring that can somewhat hide the mess. When the job was done, I could really have a better understanding of those words of wisdom. The floor was clean, probably the cleanest it has been since it got put in. I totally got it and honestly it was quite stress relieving, that is for the 20 minutes it actually stayed cleaned. Honestly, the thought was running through my head the entire time that this idea I had been a bit ridiculous for a number of reasons. Combine this fuzzball that just sticks to the mud with the addition of a 4-year-old and 2-year-old who think that every puddle needs to be jumped in and you have yourself a recipe for a mess. At this point I knew it was no one else’s fault but my own. As I look around and see the muddy paw prints that are like a trail going from room to room. Go ahead and laugh, laugh at the stupidity that I would make such an error as in cleaning my floor on my dreaded hands and knees less than 24 hours before getting a puppy! I’m pretty certain that I was foolish to ever do such a task. So instead of cleaning them up, they are still there littered throughout our house and I quit from even worrying about them. Instead I moved to the kitchen because a good snack always does a soul good. 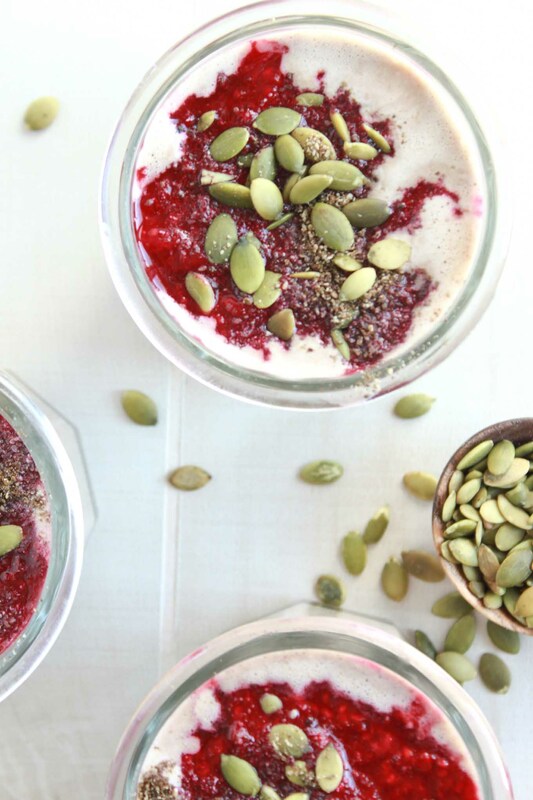 What better spring snack than this dairy free chai spiced yogurt made with coconut cream and topped with warm berry sauce, chia seeds and pumpkin seeds to add that crunch? Chai because it is possibly my favorite drink ever that unfortunately has way too much sugar normally and this coconut cream that has the texture of yogurt all coming together like a parfait. A parfait you guys! Has anyone else been missing a parfait like crazy? Well miss no more because this fulfills every craving you’ve had for one. Plus, this cream could just be eaten as yogurt. 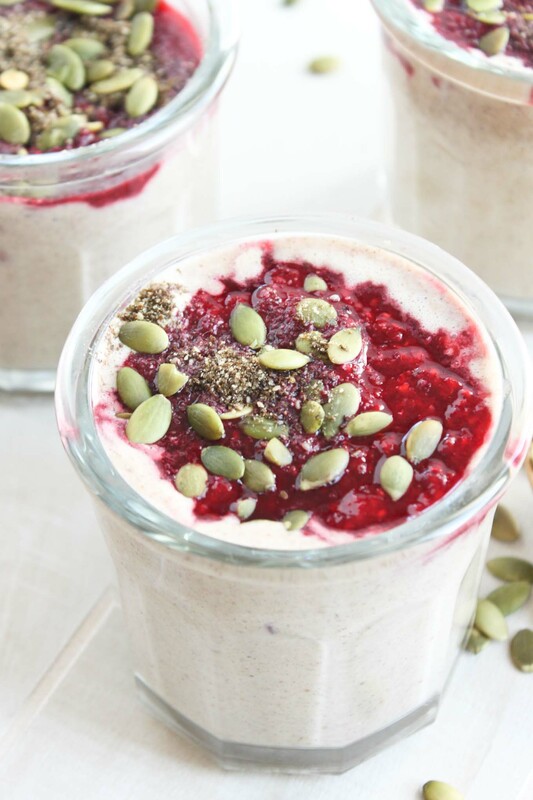 You won’t regret adding this to your recipe collection. Trust me, it takes away any and all anger, especially that towards my house that stays clean for less time than it took me to get it clean. Am I alone here or is this common? ->INSERT SOBBING<- I’m just going to sit here and spoon it into my mouth as I assess the damage to my floor. My sparkling clean floor that now has a layer of dirt, everywhere. Now if only there were a floor fairy to come clean it up for me again. 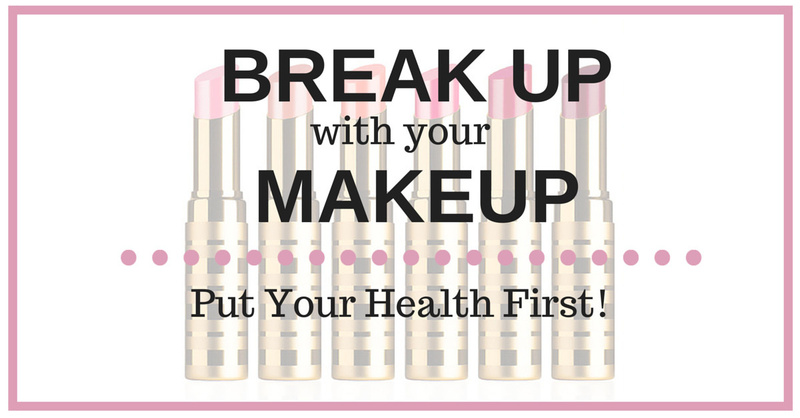 **Note this is a Simple Cleanse Approved Recipe. 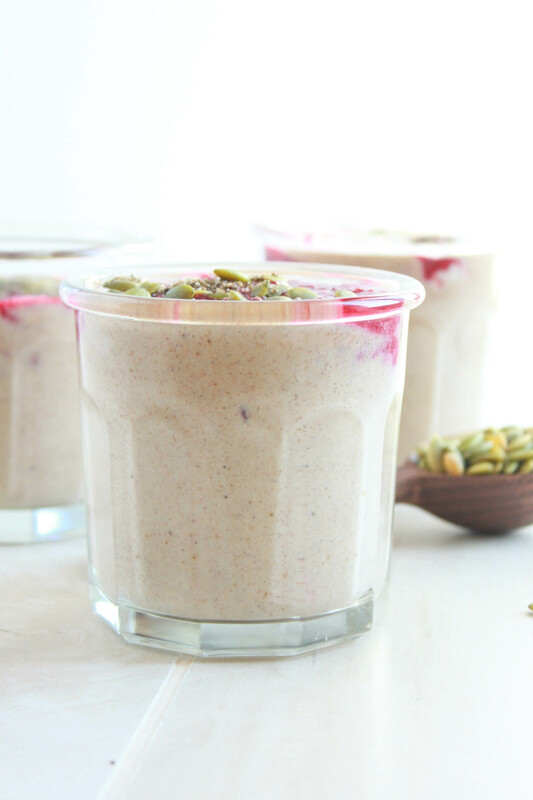 Add the cream from coconut milk, almond milk, coconut flakes, cinnamon, nutmeg, cloves, allspice, cardamon, ginger and honey to blender. Puree until smooth. Remove and place in a bowl or individual cups. Add berries to a pan and heat until warm. Add to blender or crush. 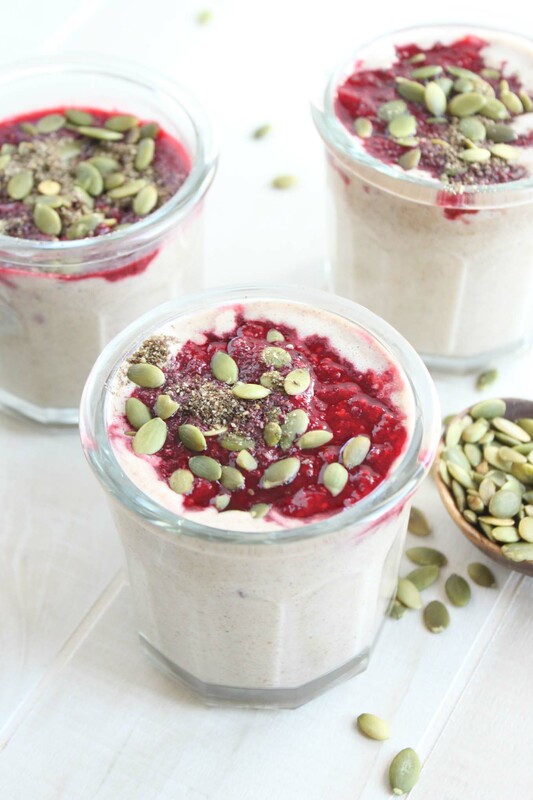 Top coconut cream 'yogurt' with berry sauce and add some pumpkin seeds and chia seeds.